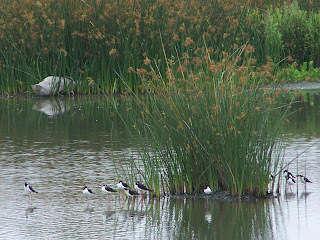 The San Joaquin Wildlife Sanctuary is managed by the Irvine Ranch Water District. Its functions include being a wildlife sanctuary and more practically, a natural water filter for the IRWD. So successful is it in this function that the IRWD and Orange County plan on building lots more. Lucky for us wildlife lovers, because it looks like they too will have a dual role as water filters and wildlife sanctuaries. The Audubon Society headquarters are here and many environmental groups meet in the other buildings here. Audubon has lots of activities for kids including a summer camp. San Joaquin Wildlife Sanctuary has a long and varied history. Farming, gun clubs, wildlife preserve, and other uses I am sure. I heard the ponds were dug by the Duck club to attract waterfowl for their members to hunt. Some say the IRWD built them, but the timetable on the Audubon site seems to suggest that the duck clubs built them. For years, the ponds were listed on the local maps as "duck ponds." Pond with Irvine in the background. The first time I went to the SJWS in April of 1985, it was just an unkempt duck club. It looked pretty neglected. The last duck club closed shop in just three years later in 1988 (SJWS Timetable). My friend Gloria, her friend, Elizabeth, and I were let in by an Irvine Ranch Water District employee. He opened the gate and left us to ramble in the tangled under growth. And ramble we did with no clear map and only our sense of direction and a few words of guidance from the IRWD employee. We were amazed by the birds we saw. What stood out the most were the number of swallows there--hundreds and hundreds of various kinds. They were all over the chain link fences and shrubs. And the White-faced Ibises! We had never seen them before and didn't even know they were there. Many Black-Crowned Night Herons in groups of up to three. Unknown number Dowitchers--may be long-billed. One of the paths between the ponds. It was hard to take in all the birds flying around us. When I think back on the way it looked when I first saw SJWS, I think that now it looks so civilized and refined. Then it was wild. The paths were not clear and a bit overgrown. It was exciting in a wild way that it isn't any more. 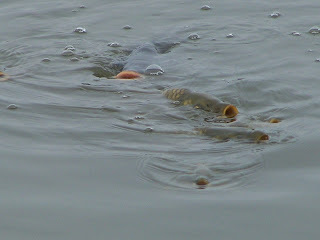 Yet there is an excitement about coming up to a pond now and seeing what is out there swimming, diving, and wading. There is an accessibility that there wasn't then. I know where I am going and how to get back out. Nice, clear paths offer something else. A place for wildlife to share the paths with you. There is nothing like coming across a Great Blue Heron strolling along the same path as you are. Or to see a Bobcat early in the morning padding along the nice, broad paths. (I have seen a Great Blue Heron walking along the path, but have not yet seen a Bobcat.) Even hanging out by the Audubon House and seeing Turkey Vultures in the trees it something that gets a birder's blood running. Or seeing a clear view of a Common Yellowthroat in a tree or among the reeds. The swallows have houses, and there are maps to show the way through the Sanctuary--and bathrooms! What luxury! But most important, the wildlife is still there and thriving. The Sea and Sage Audubon Society's Audubon House is a treasure trove--a tiny museum of stuffed birds, exhibits, and books. As well as Cd's, DVDs, tee shirts, and other bird stuff for sale. They hold events like an annual pancake breakfast, an annual barbecue, bat walks in the summer, a summer camp for kids, a monthly bird walk (second Sunday of every month), and much more. Birds abound in the SJWS. Especially in fall and winter. But spring is not too shabby either when birds are breeding and nesting. 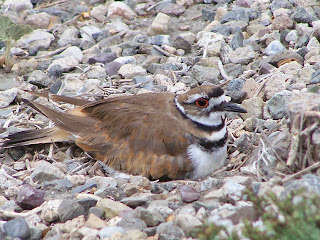 Just like the Killdeer above who nested very close to the path. She remained so still that many people never even saw her or her camouflaged eggs. I was lucky enough to have both pointed out to me. This little bird had nerves of steel. I was not as close as it looks--for those who might be concerned--I have a zoom lens. Mom finally took a break. Boy, these little eggs were hard to see when I walked by! Lucky for the Killdeer they are so hard to spot. Come by and check out this wonderful Orange County birding hot spot and the terrific Audubon House. 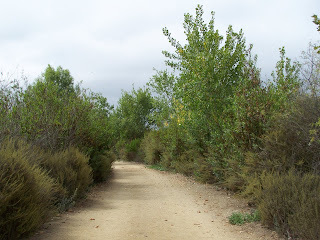 The San Joaquin Wildlife Sanctuary is Located at 5 Riparian View, Irvine CA 92612. It is east of the intersection of Jamboree and Michelson. 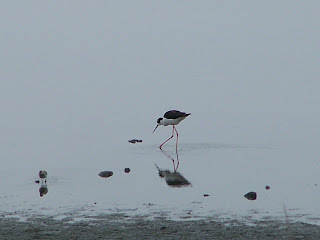 For many birders this is one of the great places to see birds in Orange County. It has less people than Bolsa Chica, but lots of birds. Don't miss it. For directions and hours see the the Sea and Sage Audubon SJWS page. A path and a pond. Big fish in a duck pond. Now you know what draws the big birds! Great Blue Heron standing on a path by several ponds. Check out the bird checklist. Look at the trail map. Great timetable of the SJWS. The Audubon House at SJWS is full of books, videos, and all sorts of bird-related items. There are stuffed birds and animals that were not killed by Audubon but found dead already and taken to the taxidermist for preservation. Great education tool. They loan binoculars and have all kinds of handouts. They even sell some snacks. And there are some great volunteers here to chat with. There are bathrooms in a nearby building. Brochures and links (don't miss the links at the top) about the IRWD Natural Treatment System and how they are expanding it. 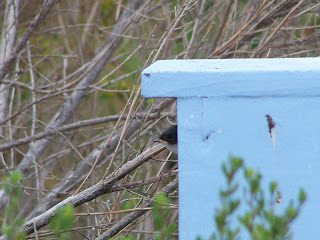 Tree Swallow peeking out of nest box. Orange County history blog. Post about the Duck Clubs in OC in years past. The Orange County Wetlands Task Force. This link goes to a list compiled by Peter J Bryant, School of Biological Sciences, University of California, Irvine. Part of a larger site the Natural History of Orange County. Helpful site.